Would You Rather: Used Ferrari 360 Or New Lexus LS460? Friend: Would you rather have a Range Rover or a G-Wagen? Friend: Range Rover or a Bugatti Veyron? Friend: Range Rover or all the gold in the known universe? Me: Well… is the Range Rover supercharged? I had the opportunity to play my own real-life automotive 'Would You Rather' last week, when the press car people came by to drop off a 2014 Lexus LS460 F-Sport. For those of you who don't know your luxury sedans, this is the top-of-the-line Lexus model, featuring all the bells and whistles: navigation, cooled seats, Bluetooth, adjustable suspension, swiveling headlights – you name it. It also has that grille that scares small children. Now, before we get into this, I know what you're thinking. Namely: Are you a complete idiot? 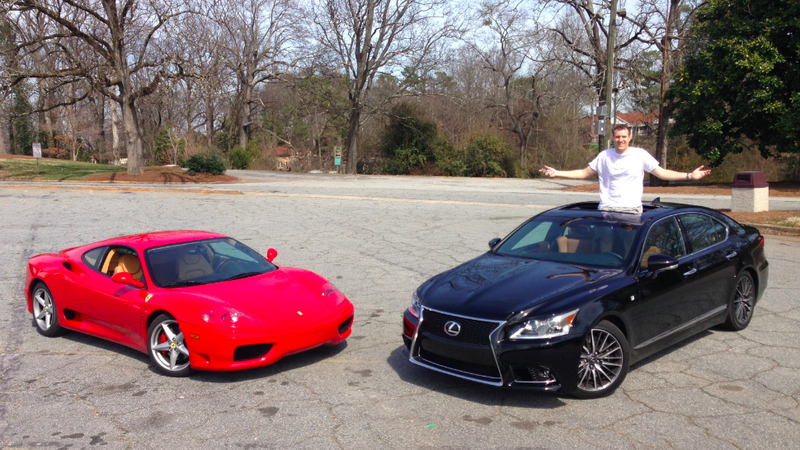 After all, one of these is a full-size luxury car, and the other is a used Ferrari. But consider this: the two cars cost almost exactly the same. That means every time you're driving around and you see an LS460, or an S-Class, or a 7-Series, you know the owner could've chosen a used Ferrari instead. In fact, he probably spent a lot of time considering that all-important question: Do I buy a new luxury sedan? Or a ten-year-old sports car that poses a bigger fire risk than an unattended space heater? Of course, most of you would choose the Ferrari. But before you do, I think it's important to remember one simple fact: the Lexus is better in every objective way. I mean, it's more comfortable, more reliable, and better-equipped; it has a warranty, back seats, and a usable trunk; it's just as powerful, it's cheaper to insure, and it gets better gas mileage. Also: you can park the Lexus anywhere without worrying that someone will scratch it, thereby damaging its soul. Largely because it doesn't have one. As for me, I decided to settle this issue the only way I know how: by making a low-budget video. So turn up your speakers, sit back in your office chair, and feel free to enjoy every uninformative minute. There are four. As for me, I'm going back to the couch. I think Lorelai is about to finally get together with Luke.